5 miles on the schedule....done! This is just a quick reminder that there's still time to sign up for the inaugural Brückeläufe half marathon. You have until Wednesday to sign up online otherwise you will need to sign up on race day. 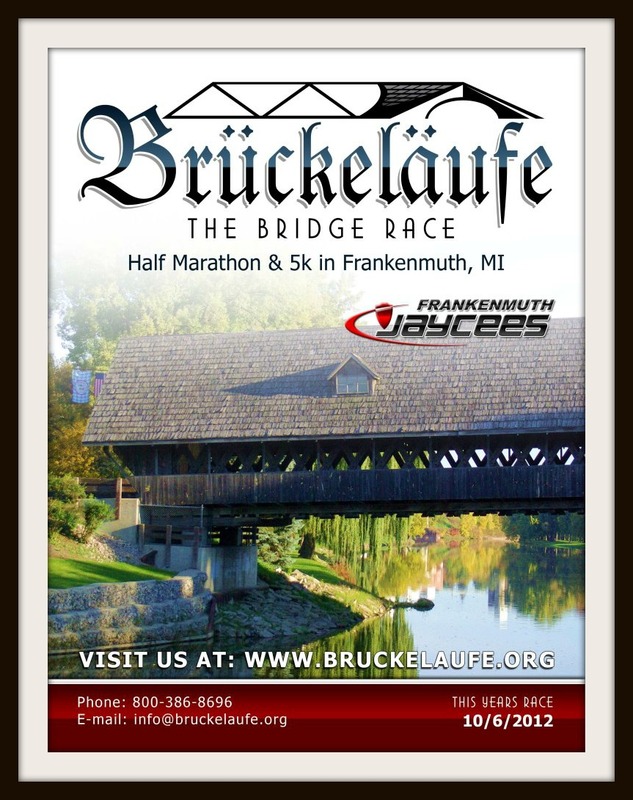 I'll be running this race on Saturday in Frankenmuth, Michigan. I'm a race ambassador for the race and hope you will consider joining me. I've had fun talking about the race over the last couple months and am really looking forward to running this race to give you a complete race review. Just to confirm because several of you have asked - there will be race medals to all half marathon finishers. 13 bridges over 13.1 miles! Let's do this! To learn more and sign up now - go HERE! I like the idea of 13 bridge in 13 miles, I think I counted 7 bridge in the marathon I ran the other day, but those were over freeways and things like that... That bridge in the picture looks amazing. Looks like a fun race, they even had a joggler in their gallery! Don't forget, this is a training run! :-) I have a feeling though that you will still end up with a speedy time. Nope. Just under 2 hours is all I will be doing. Going to try and take pictures of all the bridges along the way plus foot is bothering me. That sounds like such a cool race! I am sort of all booked up and may only be able to do local stuff for a while, but I hope it goes well this year so there will be more in the future!